i know some families are looking in this space for information about next year…here is some! this will stay up there alongside other information too. watch your email for a letter of confirmation including tuition information in the next couple of weeks. d is for dog wash? I just tonight stumbled upon your website!!! Love it!! Wish your preschool was closer to me so I could visit. 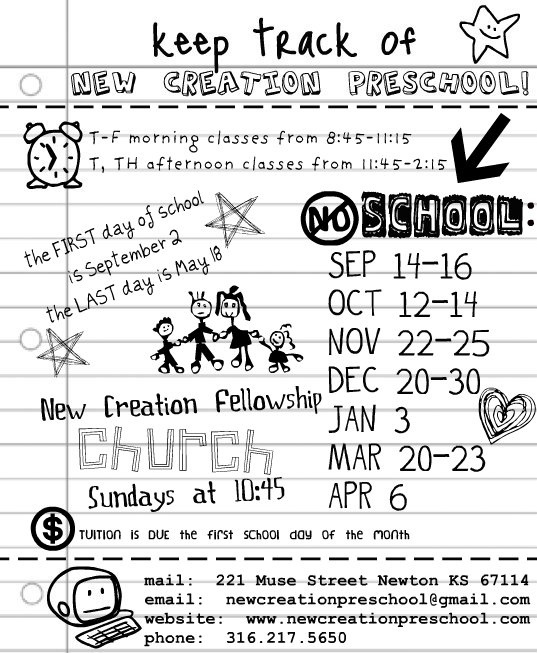 I would love to know how you created the above “Keep track of New Creation Preschool” information sheet. Can you share the program you used to do this fantastic handout? Thank you in advance! Find out how a ‘story sack’ can make reading with your child so much more fun! All children love reading books; predicting the next part, imitating the character’s voices and joining in the parts that they know well. We all know that reading is a vital part of a child’s development and engaging children in books from a young age goes a long way towards making them into lifelong readers. Beautiful layout! Wish you a year full of joy!